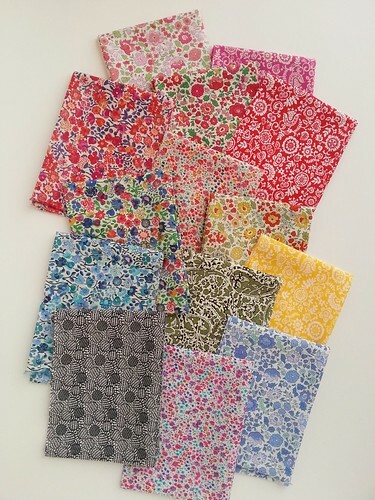 Oh man, I love Liberty fabrics! Though, to be honest, I've never bought any before as they are super expensive. But when Amanda had Liberty on her black Friday sale I snatched up a small bundle. Liberty of London Rainbow of Beauty, a photo by simple girl, simple life on Flickr. Besides being beautiful, Liberty fabrics are very soft, with a feel similar to that of voile. They will make a luxurious quilt someday! My favorite pieces of this bunch are the lighter pink/green floral at the top, the multi tiny floral at the bottom, and the periwinkle floral right next to it. So Pretty! I'm hoping this will be just the beginning of my Liberty collection. Such beautiful fabric! You are lucky to have found them on sale. I have never sewn with any of these lovely fabrics before. Funny my favorites are the same ones that you picked. Have fun with that gorgeous bundle!